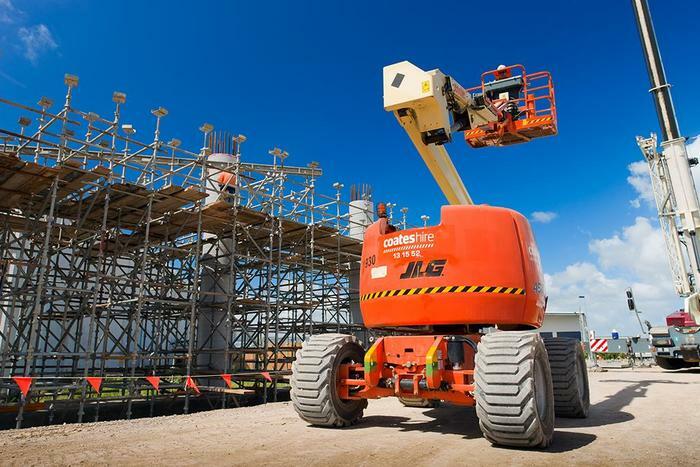 Coates Hire supplies all kinds of equipment to projects across Australia, from Perth’s Australia Day fireworks display to Sydney’s $3 billion NorthConnex tunnel works. The heavier items in its roster of more than a million – things like 17-tonne drum rollers and 12-tonne earth movers – have to be loaded onto and unloaded from the back of trucks at Coates’ 150 locations Australia-wide. It is this part of operations that the company recognises as its “most hazardous activity”. At the end of 2017, Coates introduced a strict loading procedure in an effort to reduce injury risk and bring about, as the company's CEO Jeff Fraser puts it, a ‘zero harm culture’. The new regime is working well, but the company is now exploring how technology can better enforce rules and further boost safety. “We’re always looking at ways to improve safety. We’ve got a fairly rigid process in place and its working really well, we’ve got some really positive results – how can we now use technology to support that and make it even better?” says Coates Hire's chief information officer, Ben Waterhouse. “The aim is to double down on safety and make our load and unloading process as safe as possible,” he adds. Using a new-to-the-market computer vision based tool – Warnie, by Brisbane-based firm Bigmate – Coates hopes to avoid incidents and soon literally sound the alarm on safety breaches. This month it launched a ‘proof of value’ pilot at two of its branches. The pilot involves running video feeds from on-site CCTV cameras at two Coates locations in Sydney; a major hub in Moorebank and smaller branch at Auburn. The feeds are run through Nvidia Jetson TX2 GPU modules on-site. The edge devices lverage Amazon Web Services’ Greengrass service Lambda, and Bigmate’s real time computer vision OpenCV implementation. The device identifies objects like people and vehicles and predicts their trajectory. “We’ve created a neural net that can recognise equipment – be it forklifts, trucks, cars – and people with just about 100 per cent accuracy. And based on their historical data, their historical trajectory, we can predict with high 90s accuracy if they’re going to intersect,” Orr explains. All the processing is done at the edge, so that if a vehicle and person are likely to collide a warning can be sounded in time to stop it. “Latency in that environment is incredibly important because you don’t want to find out someone got hurt 10 seconds after they got hurt,” Orr says. There are other advantages to local processing. “Events are rated typical within about 300ms of events occurring. And if we lose connectivity the device…runs autonomously until the internet connection comes back and it can upload data but it can also interact with other devices at the edge,” says Bigmate chief technology officer Peter Girgis. “If you have a big red light in the warehouse, if there’s an imminent collision, that could be flashed; or it sees someone running it could flash a local device without relying on connectivity,” he adds. Potentially, an imminent collision could trigger a switch to halt the forklift if safe to do so. In Coates’ pilot Waterhouse is focused first on the potential incident detection capability of Warnie. “At the end of that three months we’re hoping to get a solid set of data to see how it has worked, what it’s detected. Hopefully it detects nothing and if it doesn’t detect anything we’ll simulate in a controlled environment a risky situation,” Waterhouse explains. No alarms will be triggered by the devices for the pilot, although Waterhouse described the feature as an “exciting possibility”. The device can also produce a ‘snapshot’ of every time a safety rule is broken – for example somebody running across a lot or getting too close to a working vehicle. “Currently, say a warehouse manager will sit one day a week and look at all the video and it will take him a day to look at the video. Now we can say here are the five incidents that happened – it takes them fifteen minutes to look at,” Orr says. “It’s like having a safety officer who never has to go to the toilet, who never has to go to sleep, always watching and always taking note of bad behaviour,” he adds. The snapshots can then be used to better target worker safety training and education. The incidents can also be included in higher-level reports – created by Bigmate using TIBCO Jaspersoft – for managers and executives. Bigmate is also working with a major global warehousing firm on Warnie pilots. “We’re really proud of what a little old Australian company has done and we’re looking very much onto the world stage,” Orr said. The computer vision pilot is the first to emerge from Coates’ newly established innovation lab, which sits within the IT architecture team. Members of the team dedicate about a fifth of their work time to explore emerging technologies that may bring value to Coates or its customers. “Ultimately I believe emerging technology is going to be a key part in what differentiates businesses going forward,” says Waterhouse, who has been with the business for 10 years. If a technology shows promise – robotic process automation and advanced data analytics are also slated for imminent pilots – the team connects with a stakeholder within the business to stand up a proof of value over a three-month period. “So it’s not just the technology team saying, ‘Hey this is cool we want to play with it’. We do a bit of a ‘This is interesting, there might be something here’, then go and talk to some key business stakeholders to find a business leader that will own it,” Waterhouse explains. The short pilot time means ideas can fail fast or be optioned for further exploration: “you don’t want them to drag on,” Waterhouse says. It also means ideas can be reassessed at a later date. “The market and the landscape are changing so rapidly that you need a way to really understand what’s happening and try and do that in the most rapid cycle possible. Because you might look at something today and say – ‘there’s nothing in it’. But in six months’ time it might be something you want to look at in more detail,” he says. The lab also allows the company to consider new technologies within a tight budget. “We’re limited in how much we can invest in innovation, we’re not a bank, so we’re trying to come up with a way to touch these emerging technologies and spend a little bit of time focused and dedicated to looking at them – without sinking millions into innovation ideas,” Waterhouse says.